There is one of two camps that you fall into when going into a Nicholas Cage film. There are those that prepare themselves for the worst and those that are expecting a fun and mindless entertaining film. Though there are about enough films that I can count on one hand that I actually enjoy the Oscar nominated actor in (he won for Leaving Las Vegas in 1995). Unfortunately he has also done over twenty films that I try to avoid like the plague. Thankfully, given my already low expectations preceding Season of the Witch, this film of knights, demons, and the plague came out a little better than expected. Season of the Witch begins with a relatively effective sequence involving a village hanging three women from a bridge for witchcraft. This sequence introduces the theme of the horrors people do in the name of God, which continues pretty heavily throughout the remaining film. From there we are introduced to Behmen (Nicholas Cage) and Felson (Ron Perlman), two knights in the Church’s army. After Behmen accidentally kills a young woman in battle, the two men head out into the land as deserters from the Church. The two are soon discovered in a village that has become diseased by the plague. Forced by the dying Cardinal (Christopher Lee), the two have to transport a witch to a monastery as a punishment for their desertion. It is at this monastery where the Church will be able to vanquish the evil from the girl whom they believe is the cause of the plague. The film really doesn’t kick into gear until their journey transporting the witch. In order to reach the monastery safely, Cage and Perlman team up with a couple of interesting characters that actually outshine the two lead actors. Their journey is filled with attention-grabbing set pieces that include a mass grave, a rickety bridge, and a wolf attack. Needless to say … the film is not boring. In fact, I found it entertaining! Though the film doesn’t really offer anything new we haven’t seen before (including a dumb story line of a young boy who has to prove himself along the journey), the beautiful scenery and competent acting propel this film to a higher level than Cage’s typical fare. Everyone turns in a decent performance, but Stephen Campbell Moore (who plays the traveling priest) and Claire Foy (the witch) both stand out among the rest. Foy does a great job forcing you to question whether or not she really is a witch. Even though this film has many good things going for it, it is unfortunately plagued with just as many problems. Is it really that hard to maintain a consistent accent? This is something both Nicholas Cage as well as a few others struggle with throughout the film. This is only highlighted by some of the most inconsistent dialogue you will likely hear in any medieval film. One minute the characters maintain your typical “old-world” vernacular, the next minute you hear Perlman say, “He looked like you just pissed in his holy water.” Though the sets and look of the film all help you get into the journey these characters are on, it is this inclusion of modern jokes that shakes you abruptly from their world. The main detractor of the film though is the ending. I won’t ruin it for you Nicholas Cage fans out there, but the ending is ruined by an attempt at a “Hollywood” ending. After a mainly successful film using very little CGI, the film falls greatly in tone with the inclusion of way too many visual effects in its final battle (including a whole CGI character that should never have been even included in this film). It may not bother some, but the ending sticks out as a bump in the road on what was actually an enjoyable ride with some interesting characters. 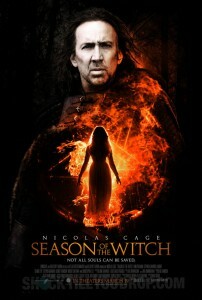 Your expectations and opinions on the man who has given us both the good (Raising Arizona) and the bad (Ghost Rider) will solely affect how you perceive Season of the Witch. I admit that I liked it more than I thought I was going to. The film is a dark journey with a few scares that are held up by some good actors and some beautiful cinematography. Dominic Sena (Swordfish, Gone in 60 Seconds) blends some horror elements with the medieval fantasy themes very effectively at times. Yet, this beast is plagued with some sore spots that unfortunately cannot be cured. I would give Season of the Witch 6.5 out of 10.